This chapter will describe the history, principles, and types of social support. A specific and systematic social support approach will be detailed. Six stages will be recommended to organize a community based social support network. This Chapter highlights the individuals whose research and writings led to the founding of Postpartum Support International. Their contributions laid the foundation of how pregnant and postpartum women, and their families are acknowledged, supported, and treated today. There has been a significant contribution from British researchers and health care providers to the field of perinatal psychiatry. Among the scientific founders of the Marcé Society were Professors R. Kumar and I. F. Brockington. They edited two scholarly books on Motherhood and Mental Illness during the 1980s. A growing body of research into psychopathology of reproduction demonstrated a vitality in the field (Kumar and Brockington, 1982). Of particular importance has been the development of the Edinburgh Postnatal Depression Scale (EPDS). John Cox and Jeni Holden edited a book in response to a conference held in 1991 to discuss the increasing use of the EPDS within the context of strategies for prevention (Cox and Holden, 1994). After offering emotional telephone and peer group support for 20 yearsthis Chapter’s author wrote I’m Listening, A Guide to Supporting Postpartum Families in 2002. The premise of the phase, “mothering the mother” is the keystone of the message conveyed to perinatal families through a method of conversational, non-judgmental emotional support. This approach believes that 1) every mother needs a mother, 2) if a mother is not well, then her family is not well, and 3) mothers deserve care and are worthy of being the focus of society’s attention. As previously stated, there is a universal message expressed throughout the perinatal social support movement. It has three simple components: 1) you are not alone, 2) you are not to blame, and 3) you will be well, your experience is real and there is help available. The oldest example of a continuously operating postpartum support organization in the United States is Postpartum Education for Parents (PEP). This Chapter’s author and her own circle of social support established PEP in 1977 (Honikman, 1986). The experience of co-founding this all voluntary, community-based non-profit is the basis of Step by Step A Guide to Organizing a Postpartum Parent Support Network in Your Community (Honikman, 2000). Itis a workbook designed in an outline format that has been divided into six stages. Some of the stages and steps can be done simultaneously. This Chapter has reviewed the history, principles, types, and research of the role of social support in assisting perinatal families. There is a legacy left by decades of dedicated individuals and groups that indicate that mental and physical health require a holistic approach. An evolution of understanding indicates that emotional and practical support is a critical component of quality health care (Logsdon, McBride, Birkimer, 1994). The biological and social scientists have combined their talents and resources to focus attention on the previously overlooked arena of maternal mental health. 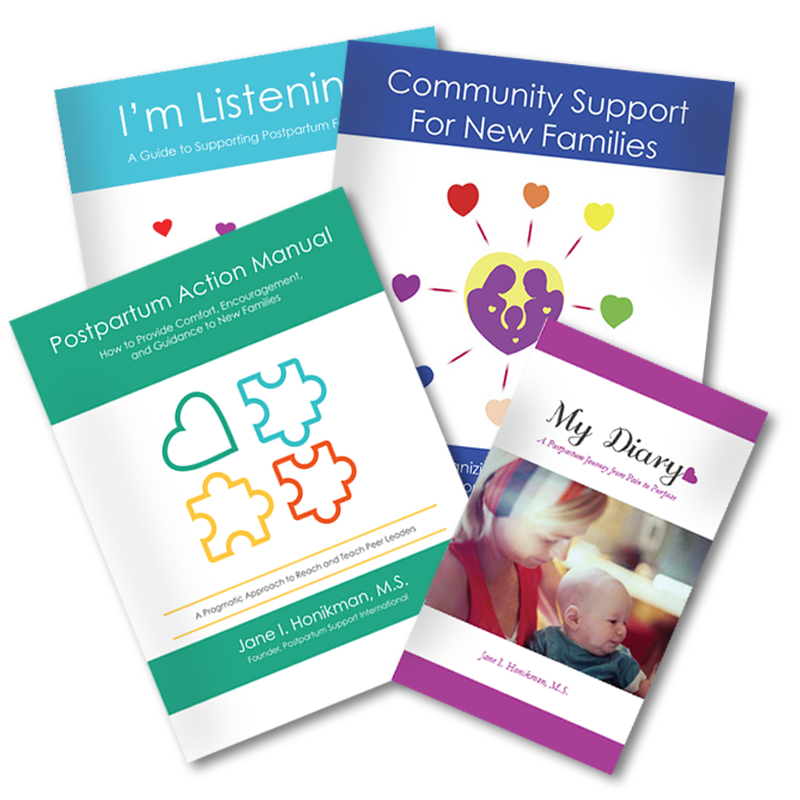 Postpartum Support International is the leader of the perinatal social support movement. The organization’s goal and objectives are part of a transformation that is outlined by The President’s New Freedom Commission of Mental Health. The goals include: 1) understanding that mental health is essential to overall health, 2) mental health care is consumer and family driven, 3) disparities in mental health services are eliminated, 4) early mental health screening, assessment, and referral to services are common practice, 5) excellent mental health care is delivered and research is accelerated, and 6) technology is used to access mental health care and information (Final Report, 2003).